20th French Film Festival ~ Philippine Freebies, Promos, Contests and MORE! It's time for more popcorns again as we celebrate the 20th French Film Festival. Aiming to endorse French culture and support the country's film industry, the festival will feature critically-acclaimed French films and at the same time honor the classic and contemporary Philippine films. There are 19 outstanding movies in this year's roster + 1 of our own entitled Taklub which was starred by Ms. Nora Aunor. Some of the films that await moviegoers are La French, Le Havre, Eden, La Belle et la bête, Les Garçons et Guillaume, à table, 108 Rois-Démons, La Famille Bélier, Lulu femme nue, and many more. However, unlike in the previous events wherein admission is FREE, this time, you must buy your own movie ticket for P100 each. This is to cover the operational costs of the cinema. Enjoy watching as many films as you can available only at Greenbelt 3 and Bonifacio High Street Cinemas. When is the time to give up? Taklub is a story of three major characters - Bebeth, Larry and Erwin, whose lives intertwine after the Supertyphoon Haiyan caused the city of Tacloban to its horrendous state - leaving the breathing figures in search of their dead ones, of keeping their sanity intact, and protecting what little faith there may be. Bebeth (Nora Aunor) searches for the remains of her three children in the hopes that any identified records could match a DNA test from those buried at the mass grave. Larry (Julio Diaz) lost his wife, consoles himself by joining a group of devout Catholics carrying a life size cross around the city. Erwin (Aaron Rivera) and his elder brother try to hide the truth of their parents’ death from their little sister. As if grieving from the lost of their loved ones is not enough, a series of turn of events - man made and natural, continue to test the endurance of the characters along with the rest of the people, awaiting for a time to wipe those slow repugnant tears. In a French provincial town, Marc encounters Sylvie one night, when he misses his train back to Paris. They wander through the streets until morning, immediately at ease, on the same wavelength, speaking about everything except themselves. When Marc gets the first train to Paris the following day, he asks Sylvie to come and meet him there a few days later. They know nothing about each other. Sylvie turns up for their rendezvous, but Marc unfortunately doesn't make it . He tries to find Sylvie, and in the process, encounters another woman, Sophie, unaware that she is Slyvie's sister. This film tells the stormy tale of a group of friends from Boulogne-sur-Mer, a French town hit by the financial crisis. A year between dreams and disillusion, imagined by teenagers from a working or middle class background, with songs that regularly add poetry, laughter, and emotion to reality. Antoine is a musician. Now into his forties, he abruptly decides to give up his career. After several days of doing nothing, he gets a job as a concierge. Mathilde lives in the old building in the east of Paris where Antoine finds work. This dynamic and generous retiree spends her time involved in charity work and overseeing the building's management. One evening, she discovers a worrying crack in the wall of her lounge. Little by little her anxiety increases and turns into panic. She begins to wonder whether the building is going to collapse. Antoine slowly becomes friends with this woman who he fears will sink into madness. Between slip ups and worries, the pair form an awkward duo, both supportive and a little peculiar, which will perhaps help them get through this bad patch. In the 1990s, Paul gets his first taste of the world of Parisian nightlife. Mad about music, he creates a DJ duo, "Cheers," with his best friend. They rapidly find a fanbase and experience giddy, euphoric, dangerous, and ephemeral success as they rise in the House music world. Caught up in his passion, Paul forgets to construct his life. Benjamin will become a great doctor, he was sure. But for its first internal internship in his father's service, nothing goes as planned. The practice proves tougher than theory. The responsibility is overwhelming, his father is absent subscribers and internal co-Abdel, a foreign doctor is more experienced than him. Benjamin will suddenly confront its limitations, fears, those of its patients, families, doctors, and staff. His initiation starts. 1810. After losing all of his ships at sea, a ruined merchant is forced into exile in the countryside with his six children. Among them is Belle, his youngest daughter, a joyful girl full of grace and charm. One day, on an arduous journey, the merchant stumbles on the magical realm of the Beast, who condemns him to death for stealing a rose. Feeling responsible for the terrible fate that has befallen her family, Belle offers herself up in her father’s place. But at the Beast’s castle, it is not death that awaits her, but a strange life in which moments of enchantment are mingled with joy and sadness. Every evening at dinner time, Belle and the Beast sit down together. At first like strangers with nothing in common, they slowly discover one another. While Belle must reject his amorous advances, she tries to unravel the mysteries surrounding the Beast and his realm. When night falls, fragments of the Beast’s life are revealed to her in dreams, and she discovers a tragic story in which this lonely and ferocious Beast was once a stately prince. Armed with her courage to overcome countless dangers, Belle opens her heart and manages to release the Beast from his curse. In doing so, she discovers true love. In the Bélier family, everyone is deaf except sixteen-year-old Paula. She is an indispensable interpreter for her parents in the daily running of the family farm and the selling of their homemade cheeses at the market. One day, encouraged by her music teacher, who has discovered her gift for singing, Paula decides to prepare for auditions for a singing course at Radio France in Paris. This choice means leaving her family and taking her first inevitable steps toward adult life. Marseille. 1975. Pierre Michel, a young magistrate who's moved south from Metz with his wife and children, is appointed a judge of organized crime. He decides to attack The Connection, a gangster organization that exports heroin throughout the world. Taking no heed of warnings, Judge Michel sets out alone against Gaëtan Zampa, an emblematic figure of the crime world and a boss whose position and contacts make untouchable. But the judge rapidly comes to realize that, to get results, he must change his methods. A 30-year-old man lives with a woman in a small, furnished rental. He has a daughter by another woman – a woman he abandoned. A theatre actor and very poor, he is madly in love with this other woman. She was once a rising star, but all offers of work have dried up. The man does everything he can to get her a role, but nothing works out. The woman cheats on him. And then she leaves him. The man tries to kill himself, but fails. His sister visits him in hospital. She's all he has left - his sister and the theatre. For several months, between 1978 and 1979, the inhabitants of the Oise in France live in a state of terror and anxiety: a maniac is on the prowl, and young women are his prey. After trying to run over several women with his car, he final manages to injure and kill female hitch-hikers he picks up at random. The man is everywhere and nowhere, eluding the traps set up by investigators and avoiding roadblocks. He's so good at escaping because he is in fact a timid, young cop who lives an ordinary life and doesn't stand out amongst his squad. A model cop, he's responsible for investigating his own crimes until the maps of his murderous journey slip from his grasp. 1976. After the failure of her marriage, Agnès Le Roux returns from Africa to join her mother, Renée, the proprietor of the Palais de la Méditerranée casino in Nice. Agnès falls in love with her mother's advisor, Maurice Agnelet, a lawyer ten years older than herself. Maurice is married and has other mistresses. Agnès loves him madly. A shareholder in the Palais, Agnès wants her part of the family inheritance owed to her after her father's death so that she can pursue her own life. Rigged gambling empties the casino's coffers. Renée receives threats. Behind these maneuvers lurks the shadow of the mafia and of Fratoni, the boss of a rival casino who wants to take control of the Palais. Shunted aside by Renée, Maurice puts Agnès in touch with Fratoni, who offers her three million francs - the equivalent of her inheritance - to vote against her mother during a board meeting. Agnès accepts the deal. Renée loses control of the casino. Agnès begins to feel guilty about betraying her mother. Maurice distances himself. After a suicide attempt, Agnès disappears on November 1, 1977. Her body is never found. Thirty years later, Maurice Agnelet is still the suspect of this crime without proof or cadaver. Convinced of his guilt, Renée fights for him to be put on trial. Guillaume Gallienne adapts his stage show, a hit with the public and critics alike, for which he won the prestigious 2010 Molière for Best Male Newcomer. "The first memory that I have of my mother is when I was four or five years old. She'd call us, my two brothers and I, to dinner by saying: 'You boys and Guilliaume, come and eat!' The last time that I spoke to her on the phone, she hung up by saying: 'Hugs and kisses, cherie [the feminine form]. Well, let's say that between these two sentences there are a few misunderstandings." Following a botched job interview, Lulu decides not to return home, leaving her husband and their three children in the lurch. She premeditated nothing; it all happened quite simply. She steals a few days of freedom for herself, alone, on the coast with no other purpose in mind than to take full advantage of the moment, without feeling guilty about it. On the way, she crosses paths with a variety of people who, like herself, are at the edge of the world: a strange guy protected by his brothers; an old woman who is bored to death; a female employee hassled by her female boss.. Three decisive encounters that will help Lulu rediscover an old acquaintance she's not seen for years: herself. 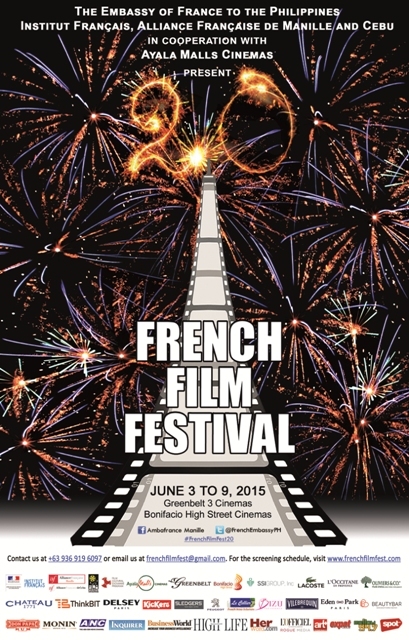 For more info, log on to ambafrance-ph.org, ph.frenchfilmfest.com or call +(63) 936 919 6097 or email frenchfilmfest@gmail.com.